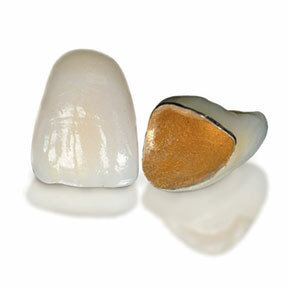 Captek is a highly esthetic PFM dental restoration. Made of ceramic fused to a 22kt gold understructure, also providing a warm, lifelike appearance at the gingival margin. Thanks to advancements in nanotechnology, Captek’s unique formulation makes it ideal for crowns, bridges and implants. Biocompatible and corrosion resistant, clinical tests have shown that Captek exhibits less bacterial accumulation than natural teeth in the same mouth.